Strategic spatial planning determines where development should take place in Ireland. It can improve the quality of life, improve society and the environment and underpin the delivery of effective public services and the capacity for economic growth at national, regional and subregional levels. In other words it decides where we live, work and play – and so crystallises much about our way of life. Because of demographics and development -pressure spatial planning, or the lack of it, is setting in concrete our living conditions for several generations. A new National Planning Framework (NPF) is being prepared for Ireland to succeed the National Spatial Strategy 2002 (NSS). The NSS failed abysmally and was officially scrapped in February 2013. The new framework is due to be published in the first quarter of 2017 depending on its adoption by the Oireachtas and relevant statutory requirements. The Department for Housing, Planning and Local Government published a roadmap for its preparation last December. Before we get stuck in to this, the first question must be: why did the NSS fail and what are the lessons? What was the National Spatial Strategy? The NSS was Ireland’s first national strategic spatial and territorial planning framework and was held up as, theoretically, the best in Europe at the time. The strategy was a twenty-year planning framework designed to deliver more balanced social, economic and physical development between regions. The NSS was to provide a response to the growing imbalances in socio-economic development that occurred during the Celtic Tiger period in the late 1990s. In the foreword, An Taoiseach, Bertie Ahern, states that to achieve “balanced regional development” a greater share of economic activity must take place outside the Greater Dublin Area. It requires that the full potential of each region to contribute to the overall performance of the State be developed in a sustainable economic, social and environmental basis. To achieve this the National Spatial Strategy set out a framework for gateways, hubs and other urban and rural areas to act together. In 1969 the Buchanan Report was published advocating the concentration of industrial development within ‘growth centres’ comprising, in addition to Dublin, two national growth centres in Cork and Limerick-Shannon; six regional growth centres in Athlone, Drogheda, Dundalk, Galway, Sligo and Waterford; and a further four local-growth centres in Castlebar, Cavan, Letterkenny and Tralee. This proposal proved highly controversial and wasn’t implemented, dying a death by inertia. The Gateways were: Dublin, Cork, Galway, Limerick/Shannon, Waterford, Dundalk, Sligo, and two linked Gateways Letterkenny/Derry, Athlone/Tullamore/Mullingar. The Gateways were to have populations of more than 100,000 providing “critical mass necessary to sustain strong levels of job growth in the regions”. There were nine strategically located, medium sized Hubs supported by the Gateways: Cavan, Ennis, Kilkenny, Mallow, Monaghan, Tuam and Wexford. Ballina/Castlebar and Tralee/Killarney would act as “linked hubs”. Hubs were to have population of 20-40,000 and provide localised critical mass and ‘link the capabilities of the Gateways to other areas”. Unfortunately key policy and political stakeholders rejected the concept of gateways and hubs as urban-centric and detrimental to the development of rural areas. It would turn out that the concept of rural development was largely limited to enabling residential housing construction in rural areas rather than a broader conceptualisation encompassing social or economic dimensions. The debate which followed the NSS reflected in many ways the one that had followed the Buchanan Report. Crucially the National Spatial Strategy after 2002 imported its own inertia, that of non-implementation. The Strategy had no teeth. So-called implementing guidelines such as the “Strategic Policy Guidelines” were deliberately made non-mandatory by governments viscerally antagonistic to central planning, and were duly flouted in local authority development plans, and more particularly the planning permissions that were to derive from them. It lacked teeth but it also crucially lacked a timetable and dedicated funding. Despite its feebleness it generated such a backlash that alternative measures were introduced, most notably Charlie McCreevy’s ‘surprise’ policy of “decentralisation”, actively discouraging concentrations and emphasising dispersal of industrial investment. This Department of Finance sponsored initiative ignored over half of the NSS-nominated Gateway and Hub settlements in favour of a broad, ostensibly populist ‘pepper-spread’. “Good planning policy must be guided by principles of sustainability and the minimisation of resource use. In general these factors conduce to consolidation and sensitive development of existing villages, towns and cities which tend to have economic, social and cultural infrastructure; and be well served by public transportation. It is not possible or wise to suppress housing demand but the model of predict and provide that is currently being implemented on the ground in the Greater Dublin Area and to too great an extent was enshrined more generally in the last spatial strategy, has not served the common good. There are significant social disbenefits from continuing growth of Dublin. These include congestion in Dublin and the opportunity cost of failing to staunch rural depopulation. For these inert projections of a rise in the proportion of the country’s population that lives in Dublin are dangerous. Nor is any significant increase in the mid-east (Kildare, Wicklow and Meath) since development of this area more than any in the country conduces to car-dependent sprawl. A shift in population growth away from Dublin and its hinterland. The Greater Dublin Area should accept no more than 25% of future population growth, though Dublin City and areas of social and economic deprivation around Dublin should be targeted for special investment. To insure intra-regional balance, all existing towns and villages should be encouraged to consolidate, providing for local growth and making full use of existing infrastructural potential – social, economic, cultural and environmental. Quality developments in villages, including affordable developments, may provide an alternative to one-off housing. Publication of mandatory regulations implementing the spatial strategy as soon as possible for all cities and major towns and their hinterlands. Regulations should have teeth so that they override Local Authority Development Plans. They should also have a timetabled and costed implementation strategy. A transport investment policy which is based on rail as the primary mode of inter-city and inter-regional transport, and an increase in light rail and buses. Integration of Transport and Land-Use Planning Policies. A general end to urban-generated (commuter) housing, “one-off” i.e. sporadically or unplanned in the countryside. One-off housing scores very badly economically, socially and environmentally. Much reference is made in national policy to the desirability of development of rural areas, without clarification that this refers primarily to towns and villages and is without prejudice to a general injunction against one-off housing. Outside of substantial existing settlements new residential construction should be limited to those who intend to live in the countryside because their job connects them to the land where it is proposed to build the house or for reasons of compelling social need – in order, for example, to take care of elderly or sick relatives. In short, rural development no tone-off housing development in the countryside. Above all however, once the above factors are accommodated, development must be to the highest possible quality standards. No country in the history of civilisation has been as rich as we are with the opportunity to recreate its living environment”. “Imagine a world where development improved the environment and strengthened communities – and so served the public interest, the long-term public interest. Imagine a world where developers were heroes – and not just in the property supplements. To facilitate progress a structure could be devised to ensure that the privilege of tax incentives went – and went only – to developments that served the the long-term interest of the public rather than the short-term interest of the developer i.e. to sustainable development which took account of the socio-environmental effects, not just the economic effects, of development. We need incentives for sustainability, penalties for the wrong development in the wrong place, Roundtable input, Framework Plans with teeth and a monitoring mechanism – indicators. The future of planning should rest with “roundtables”. These are “cross-sectoral partnerships”, facilitated by planners, comprising ten or fifteen people including local authority officials, County (or City) Councillors, developers, shopkeepers, environmentalists, community groups, trades unionists, tourism representatives and others. The rainbow in fact. If you can get agreement among these people you may well be looking at sustainable development”. None of this happened but instead there was a free-for-all, led by one-off housing in the countryside, in breach of national and local plans. So what is the National Planning Framework? 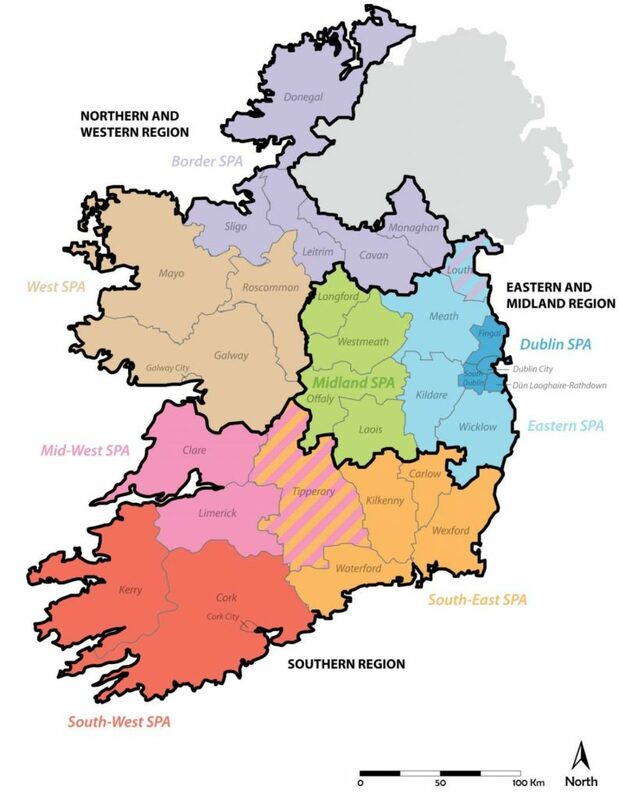 Southern Region: Wexford, Waterford, Carlow, Kilkenny (South East SPA); Cork and Kerry (South West SPA); Limerick, Clare, and Tipperary (Mid-West SPA). The main difference between the NPF and its predecessor NSS is the reduction in the number of targeted areas in favour of groupings that have demographic and economic relationships. Previously too many were created by political cronyism with a ‘one for everyone in the audience’ attitude. It is not at all clear if the Framework will be supported by measures to implement it and moving from a ‘Strategy’ to a ‘Framework’ even tends to suggest something of a retreat. A particularly robust intervention will be required if Ireland’s disbalance between Dublin’s primacy and its laggard provincial cities, is to be addressed. in the most recent inter-censal period of 2006-2011, Dublin and environs grew by almost 65,000 as against just 15,000 for the other cities. The designated Gateway and Hub settlements comprised a 42.2% share of State population in 2002 but accounted for just 27.76% of total population growth by 2011. The National Planning Framework can only work if (a) it is enforced and (b) planners in Local Authorities are given the necessary resources to promote the infrastructure that can support its prescriptions. There is a pressing need to develop the potential of Ireland’s four provincial cities. With an average size of just over 100,000 they are scarcely cities in a world context though they tend to serve as engines of growth for their respective regions. The 1997 European Spatial Development Perspective’s definition of a ‘city’ is a settlement of 200,000 – marginally greater than Cork’s 2011 population. Limerick, Galway and Waterford,with an average citizenry of just 73,250, fall well short. This scale-deficiency represents a significant barrier to their potential to exert critical-mass leverage. It also highlights Ireland’s spatial dysfunctionality insofar as it is ‘missing’ a tier of settlements with populations of 200,000 to 500,000. Policy-makers have over-estimated Ireland’s provincial cities’ ability to grow organically. It is essential that the next spatial plan address this gap, and deal with the not necessarily desirable growth of counties, and towns, in Dublin’s hinterland of Meath, Wicklow and Kildare. While most counties experienced some level of population growth three counties witnessed population decline over the last 5 years: Donegal (-1.5%), Mayo (-0.2%) and Sligo (0.19%). Three other counties grew by less than 1 per cent: South Tipperary which increased by 0.72 per cent. The cities of Cork, Galway, Limerick and Waterford have all grown faster than their surrounding counties over the last five years. After falling during the previous inter-censal period of 2006 to 2011 by -0.2 per cent, Cork City has grown by 5.4 per cent compared with 4.2 per cent for the county; Galway City has increased by 5.3 per cent, far stronger than the county which is showing an increase of 2.2 per cent, while Waterford City has seen growth of 3.5 per cent compared with only 1.4 per cent for the county. Limerick City experienced a 2.7 per cent dip between 2002 and 2006. However it has since recovered and increased by 2.1 per cent since 2011. With the capital being allowed to grow with no limits these ‘growth cities’ as identified in the Buchanan Report never got the chance to counter-balance the swell. Today almost 38 per cent of the Irish population live in the Greater Dublin Area. We have built around 500,000 units since the millennium, additional to the 1,200,000 then existing reflecting population increase to 4.76m. It is not yet clear how many more we project to build over the next decade but IBEC, in an admittedly not well-supported policy document’ Connected – a Prosperous Island of ten million people’, notes we have the youngest population in the EU – more than half under 35, and says population will rise another 30% by 2040. We have the money to forge a model new Ireland. We must not squander our opportunity”. Balanced regional development makes people happier. It’s time to prove National Spatial Strategy is not an oxymoron in Ireland. Emma Gilleece is an architectural historian writing in a personal capacity.